The Champions League quarter final second legs take place this week and you can get enhanced odds from 888Sport for the Barcelona vs Man United fixture on Tuesday night. When you open a new 888Sport account, you’ll qualify for their sign-up offer that will give you either 6/1 for Barcelona to win or 50/1 for Man United to win the match in 90 minutes. See the full details of the promotion at 888Sport. Barcelona hold a slender 1-0 lead going into the second leg but that will not deter Solkjaer’s side. In the last round they trailed 2-0 going to Paris to play PSG, before doing the unthinkable and winning 3-1, meaning they went through on away goals. If United can get an away goal here they will level up the tie, and a second away goal will leave Barcelona needing to score twice to go through. 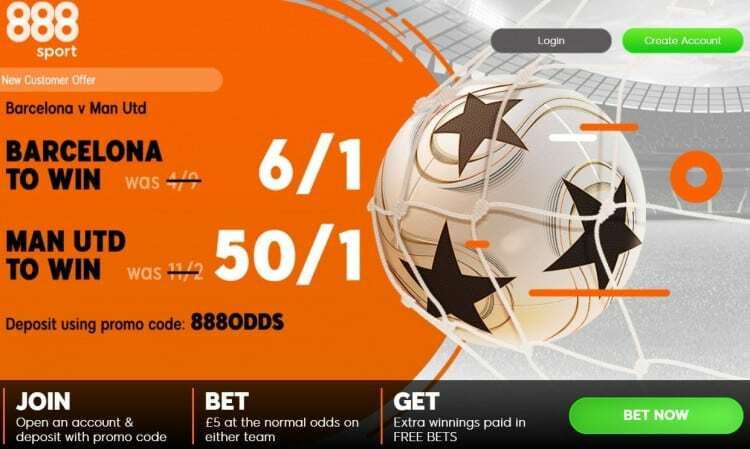 Even though it is advantage Barcelona after the 1-0 win last week, United cannot be written off and that 50/1 price boost is more than tempting if you want to win big on Tuesday’s tie. Read our Barcelona vs Man United predictions and preview.